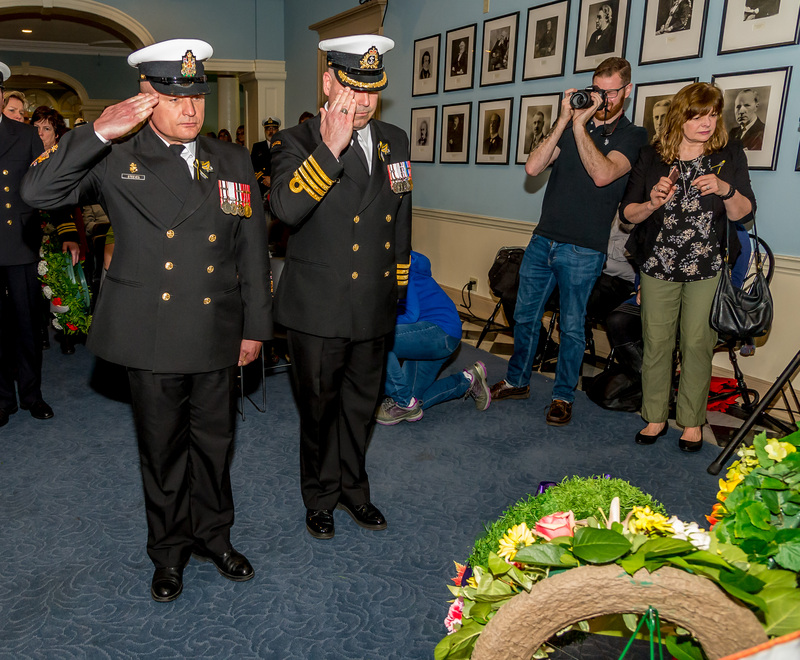 CPO1 David Steeves, CFB Halifax Base Chief, and Capt(N) Paul Forget, Base Commander CFB Halifax, lay a wreath at the conclusion of the Day of Mourning ceremony to remember those who have been injured or died on the job. Twenty-one small Nova Scotia flags stood on the shelf behind the podium in the lobby of Province House on April 28, the annual Day of Mourning for workers who were injured or killed on the job. Each flag stood for a Nova Scotian worker who was killed on the job during 2017. Capt(N) Paul Forget, Base Commander CFB Halifax, and CPO1 David Steeves, Base Chief, were among those in attendance at the ceremony. Hugh Gillis of the Nova Scotia Federation of Labour presided over the ceremony, which included representatives from government, labour organizations, unions, and several individual speakers. Jason MacLean, president of the Nova Scotia Government Employees Union, outlined 2017 statistics for the provincial workplace. Commenting on the 21 deaths, MacLean said, “These were dedicated people who were just doing their jobs.” Health and safety procedures in the workplace “are everybody’s priority,” he emphasized. Liberal MLA for Halifax Citadel-Sable Island and Minister of the Public Service Commission Labi Kousoulis, and Tim Halman, Progressive Conservative MLA for Dartmouth East, both spoke to the need to improve occupational health and safety, and expressed sympathy for the family and friends of the 21 Nova Scotians who died at work. Gary Burrill, leader of the provincial New Democratic Party and MLA for Halifax Chenucto. Burrill stated that as a United Church minister who had served in mostly working class churches, he had presided over many funerals of people who were killed in workplace accidents, whether those occurred on farms or on industrial sites. One of the most affecting presentations came from Shannon Kempton, whose father, Peter Kempton, died in September 2013 in a workplace accident. He was an auto mechanic who was killed when a car on which he was working caught fire. The emotional impact of her father’s death still affects her, according to Kempton, saying that she can still recall all of the details of that day, and of what followed. The final speaker was Marie Clarke Walker, secretary/treasurer of the Canadian Labour Congress. Clarke Walker noted that in addition to improving health and safety standards and procedures, it was also vital for workers and management to come together to fight violence and harassment in the workplace.